Our bodies can conduct electricity; therefore, if we receive an electric shock, electricity will pass through our bodies and damage tissues and organs, causing serious burns. Thus, an electric shock should not be considered as a mild situation if it does not show any visible symptoms, as damages are done internally, deep beneath the skin in the tissues and organs of your body. A severe shock may also cause the heart to stop. If a strong electric current passes through your body, internal damage may lead to disturbances in the natural heart rhythm and lead to cardiac arrest. A shock may also throw you off, causing serious trauma, fractures and injuries. Electrical burns can be serious emergencies. Take a St Mark James training course to learn to recognize and manage these emergencies. While helping the casualty, do NOT touch the person as electricity may pass through your body from the casualty’s body as well. Therefore, always make sure you properly observe the casualty before touching him. Remember, safety first! Remove sources of electricity. If it is possible, stop the electricity from running by shutting the system down. If not, keep the electrical equipment away from both of you using a non-conductive apparatus such as cardboard, wood or plastic object. One the electric current is cut off from the person, check for signs of circulation such as breathing, movement and coughing. If the person is not breathing or is unconscious, begin CPR immediately and continue till help arrives. To prevent shock, allow the person to lie down. If he is unconscious, lay him down on the floor yourself, with his head slightly above chest level. Elevate the legs to encourage circulation. If the person is breathing, cover the affected areas that have been burned with a sterile gauze bandage or clean cloth. Do not use cotton swabs, blankets or towels as they may leave residues on the burns. Always hire a professional electrician to handle any electrical wiring. Keep electrical equipment away from wet areas and do not use appliances in areas that are prone to get damp. 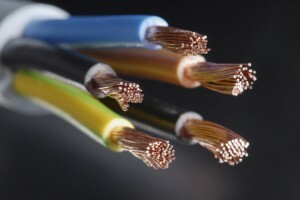 Do not use electrical appliances with wire extensions and cords that are damaged. Do not pull an appliance cord if you want to switch it off; remove it by pulling the plug instead. Make sure your electrician installs safety switches in your household. Make sure children do not poke their fingers or objects into power points and sockets. To learn more about electrical burns and how to manage them take a St Mark James training course with one of our providers listed on the “locations” page. Providers are located throughout Canada including in Vancouver, Toronto, Victoria, Regina, Edmonton, Calgary, Halifax and Ottawa. Wonderful session,but before calling emergency line, what first aid one need to giveto the person stricken with electricity?